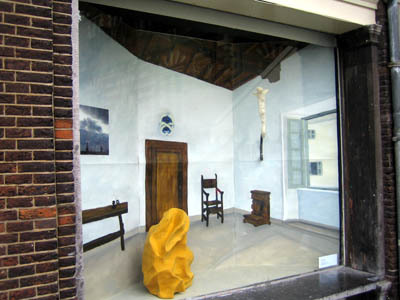 This installation was custom made for the window of De Vishal in Haarlem. It consists of two- and three dimensional work and is based on a photograph of the room of Saint Francis of Assisi, with in the middle of the room a piece of the holy mountain "La Verna", the mountain where St. Francis recieved his stigmata. The piece of rock was a gift, and of course it was depicted as the central piece in the spartan looking, scarcely furnished room. Because the perspective in the picture did not correspond with the shape of the window, the installation gave the place an interesting twist in depth. The installation reflected on the psycological effect of this piece of rock on the inhabitant of the room. The rock was made of fabric on a frame of wire and paper, giving it a soft, consoling and almost human appearance. The window the Vishal happens to be located in one of the armpits of the Great St. Bavo Church in Haarlem, a perfect place for St. Francis' room.